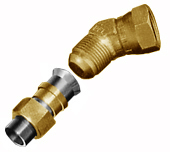 Brass connectors manufacturers, steel fittings and connectors, special products and steel fittings for fluid systems. PEL Pintossi's specific expertise and a highly qualified team of experts play a major role in helping to develop custom projects and products. Pel Pintossi is leader in fittings for flared tube mainly used for hydraulic Brass connectors manufacturers although other non-corrosive fluids can be used.